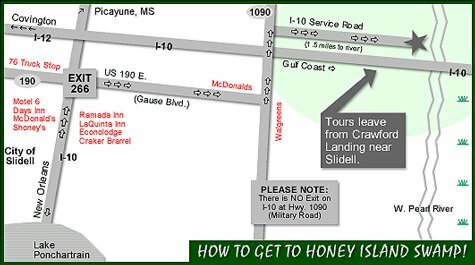 (New Orleans, Covington, Mississippi and the Gulf Coast), you must exit Interstate 10 in Slidell at exit 266 (US 190) also known locally as Gause Boulevard. Take US 190 East (2 miles) to the traffic light located at the intersection of US 190 and Highway 1090 (Military Road). Turn LEFT. Drive NORTH 1 mile on 1090 where you will pass over Interstate 10. Immediately, you will come to the Interstate Service Road. Turn RIGHT onto the Service Road and follow it 1.5 miles to its end at the Pearl River. Gift shop, restrooms and refreshments available on location.